Forget Chinese astrology and 2010 being the 'Year of the Tiger'! 2010 is REALLY the year of the Dairy Queen Blizzard. After all, it's our favourite treat's 25th birthday, and to mark the occasion in mouth-watering style, DQ has created the ultimate in ice cream trucks, the cleverly designed Blizzardmobile, visiting a city near you! Even with the birthday celebrations in full swing, DQ are still making each month special in itself with their 'Blizzard of the Month' special treats. 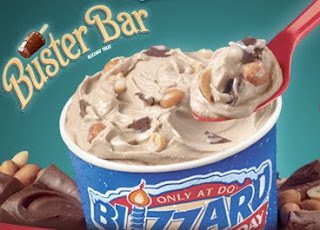 May is no different as they proclaim this month as an ode to the Buster Bar Blizzard, all peanuts, chocolate chunks, hot fudge and vanilla soft serve. Nice for some... not so nice for me. Yep, being selfish yet again as this treat is a no-go for me. Peanuts.... silly, peanuts -- are the main attraction of this concoction. Leave them out, and I'm so THERE! Sorry, DQ, just can't partake. If you could replace the actual peanuts with Reese's peanut butter cups...well, then I'd be quite happy to raise a cup with everyone else in praise of May's arrival. But alas...I'll just have to make do with the regular Blizz standby, the Chocolate X-treme. Not bad, eh? I'll gladly take this stand-in and leave the May Blizzard of the Month for the peanut lovers out there.